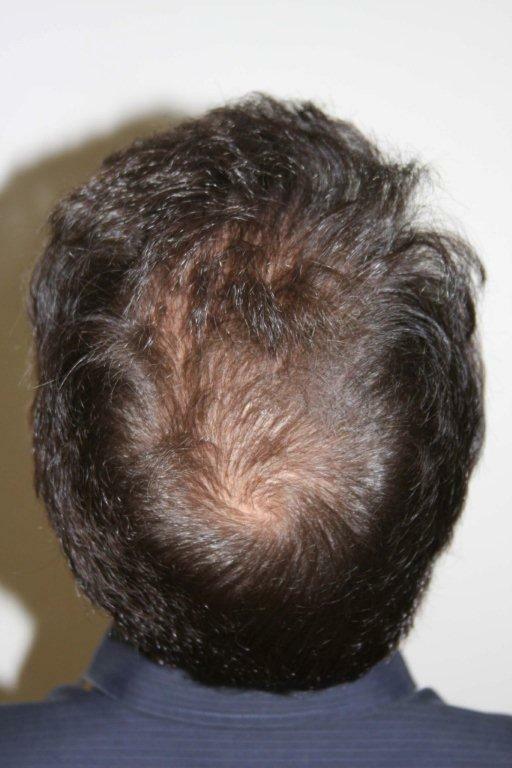 Hi, everyone, as I predicted some weeks ago, I had scheduled another appointment for a HT (FUE, 2000 grafts) at the Armai clinic in Toronto. The intention was to fill the crown and also the transition areas. See photos! 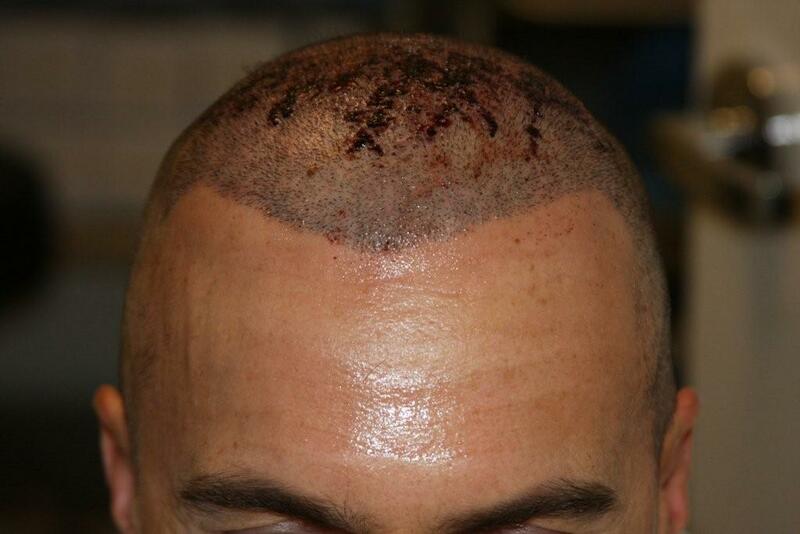 Here is my report: At 9.00 a.m the procedure starts with shaving my hair. 9.15 a.m. some freezing in the donor area and afterwards starting with harvesting of the needed grafts. I was lying on a foam matress, half time on my left side, and then on my right body side. 10.50 a.m. the harvesting was ended. Meanwhile continuous preparing and counting of the harvested follicle. After that Dr. Armani started with sticking the holes into the recipient area. Ready with this at 11.55.a.m. I got lunch and had a rest until 12.55 p.m.
Then the team started with setting the grafts into the holes. This procedure took time until 15.00 p.m.
Then I had an interview with Dr. Armai. He adviced how to take the medicaments and also gave me advices how to behave regarding the donor and recipient area in the future. Additional I got some documents about that, to read once again in the hotel room. So I was well prepared for the coming hours and days. After that we made an appointment for the next day for a first follow up. At 3.30 p.m. I was already back in my hotelroom. As I can tell you now, I needed no drug for pain relief and could also sleep during the following night. As a big surprise, this time I got no swelling in my face. After the HT, I had 3 wonderful days in Toronto with walking through downtown and sightseeing. Thanks for the update/ I’ve just looked at the pictures and your blog, and I see some white dot scarring. Have you had FUE at any point before this session and the strip with Dr Armani? Nice Ernst, with the coverage you received on that last procedure you’re going to be complete. You had nothing on top to start with, very nice. How many grafts is that total now??? 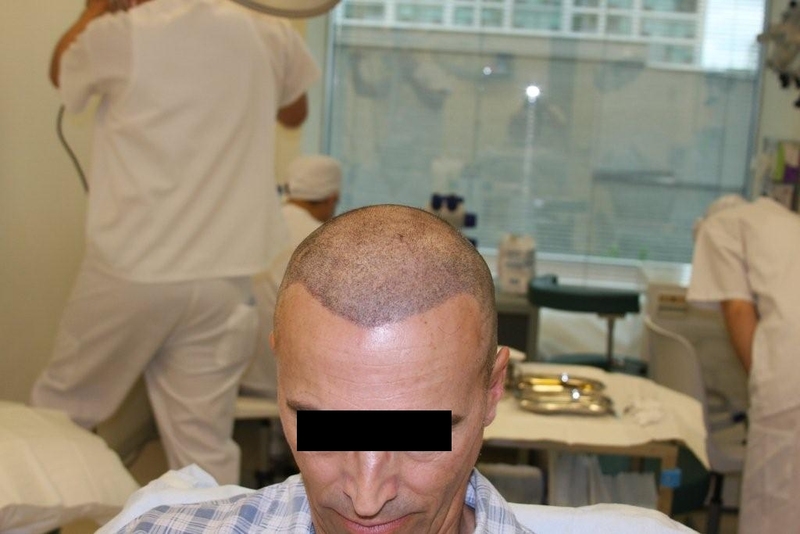 These photos should be more than enough to convince people not to get strips, I am sure your strip scars are fine by most standards, but still, they are nasty scars compared to fue even if we are talking about formation of white dots. 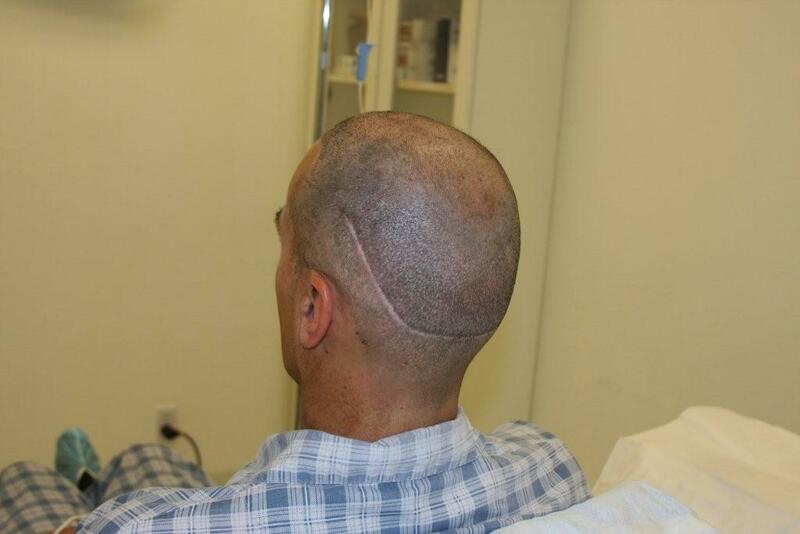 Yeh I kinda agree with this, although my scar has never bothered me that much, I would have definately have gone with FUE if its wasnt so expensive at the time I had my procedure - definately no regrets tho because the good massively outweighed the bad etc. 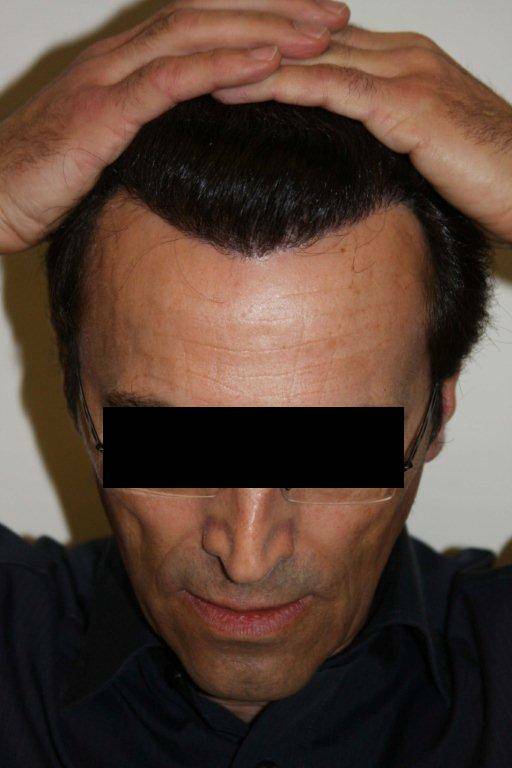 Ernst who did your previous FUE? » Ernst, that is such a nice transformation. » I see some white dot scarring. Yes, I had already 3 sessions before. 2 strip sessions (FUSS) and 1 FUE session at the Armani clinic. » many grafts is that total now??? 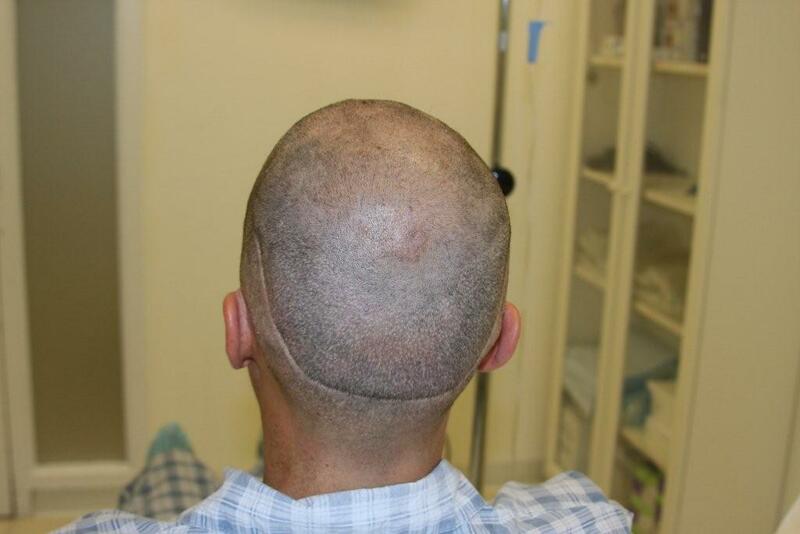 This was my 4th surgery and it is roundabout 10.000 grafts now. Yes, I think you’re right. But I can live with that scar, because I have always a hair length of more than 8 cm. 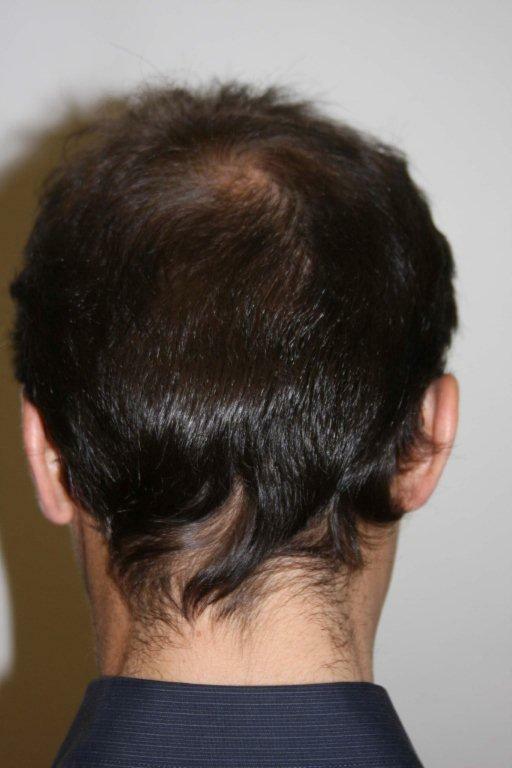 With that length of hairs, the scar never can be seen. » Ernst who did your previous FUE? » Happy healing bud, cheers! I had all 4 surgerys (1st and 2nd FUSS, 3rd FUE)at the armani clinic in Toronto. » » Ernst, that is such a nice transformation. Thank you. I am very happy about that. It gives me so much. Although the hairs are not the most important thing in life, nevertheless it is a very important thing for me and my self-respect. » intention was to fill the crown and also the transition areas. See photos! 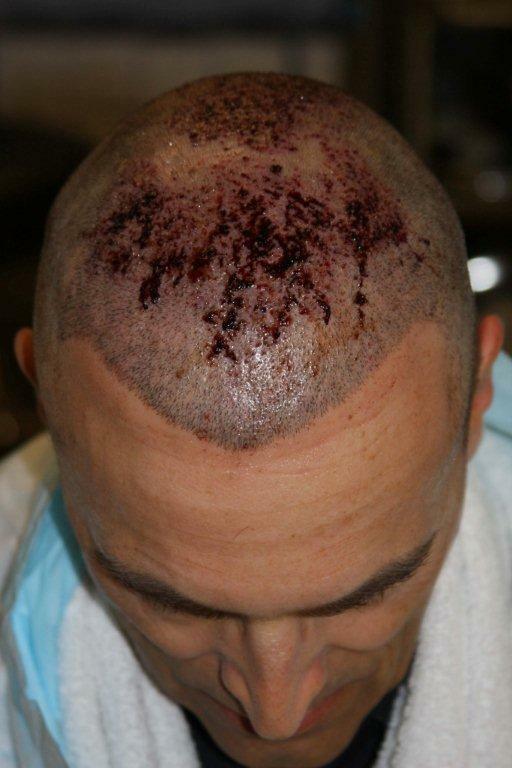 » Here is my report: At 9.00 a.m the procedure starts with shaving my hair. 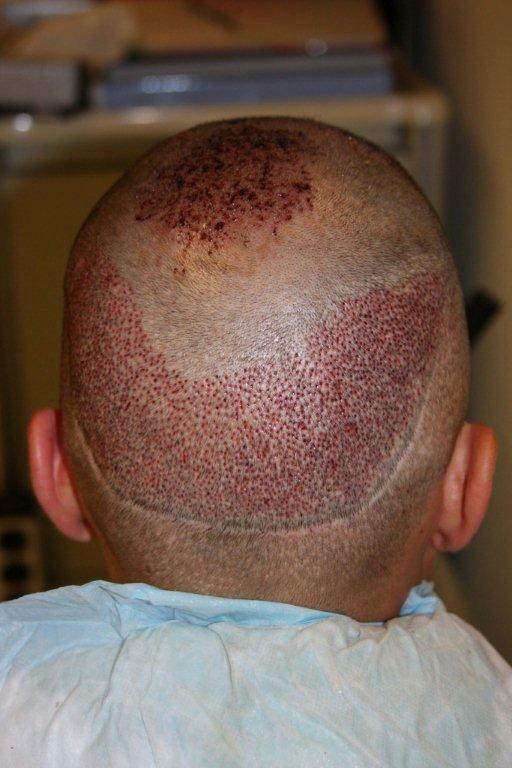 » Meanwhile continuous preparing and counting of the harvested follicle. » Ready with this at 11.55.a.m. I got lunch and had a rest until 12.55 p.m.
» procedure took time until 15.00 p.m.
» After that we made an appointment for the next day for a first follow up. » At 3.30 p.m. I was already back in my hotelroom. » sleep during the following night. » As a big surprise, this time I got no swelling in my face. Looks really dense in the photo with your hands pulling your hair back. Look forward to seeing some general shots to get a better look at Armanis good work.